There’s something very warm and cosy about A Number More than Nothing At All, the debut album from Sussex six-piece Stick In A Pot. This is perhaps unsurprising given the album was recorded in two band members’ homes, including the childhood bedroom of Stick In A Pot’s songwriter Piers Blewett, who returned to the nest recently following a couple of years living abroad. What started as a ‘scratchy’ set of eight track recordings in the Blewett family home has since been nicely tarted up to reveal a pretty good new act on the every expanding indie folk scene. With folk (of sorts) scooping top awards at The Brits recently this type of accessible indie folk is certainly of the moment and none more so than in Sussex. 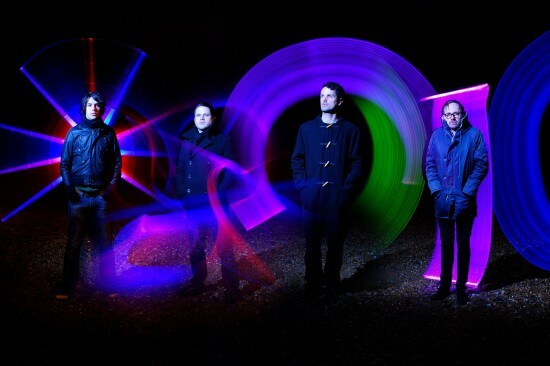 Brighton’s Bleeding Heart Recordings for example are making a deserved name for themselves through acts such as The Robot Heart. Despite being loosely catogorised within this new wave of folk Stick In A Pot are firmly their own act, offering a distinct combination of well crafted indie song writing and earthy folk vocals from Blewett. Think Belle and Sebastian and Donovan rather than Mumford and Sons or Laura Marling. The range of instruments used sparingly is central to A Number More Than Nothing At All. First track ‘Decider’ is mainly acoustic guitar and vocals, but a little bit of electric guitar pops in, so too does synth here and there over other tracks. Nothing fancy but enough to build the songs nicely and add to the melody. Banjo, mandolin and glockenspiel are all used here as well. The album’s first two singles ‘Navel Lint’ and ‘Synaethesia’, the more prog rock sounding and ludicrously titled ‘In Underpants’ and ‘Early Morning’ are among a wealth of standouts. Perhaps its because I’m from Brighton, perhaps its because like Blewett I’ve traveled abroad a bit then returned back to my family home for a spell, but I feel an affinity and closeness with this record that I don’t usually get with similar randomly sent albums by unknown acts. A lot of bedroom artists like this are plying their trade, playing support slots in pub gigs, sending people like me their self produced CDs, but Stick In a Pot are a clear cut above the rest. Whether they reach the dizzy heights of others they like to compare themselves to such as Iron and Wine is dependent as much on luck and good PR as it is on talent. But from this inviting debut they certainly deserve more attention. A Number More Than Nothing At All is released on 28 March, 2011. Sufjan Stevens has announced his first UK and European tour since 2006. The tour is to promote last year’s Age of Adz, which has been his most commercially successful album to date. Neonfiller favourite DM Stith, who is also on Steven’s Asthmatic Kitty label, will be the support on all European dates. 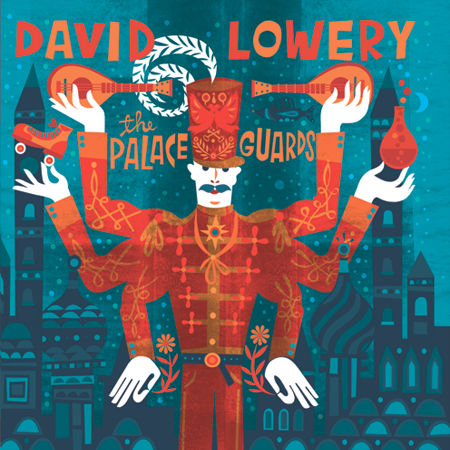 The Palace Guards is the first solo album from Cracker and Camper Van Beethoven front-man David Lowery, and it is something of a triumph. Originally conceived as a set of songs that would be released only on YouTube (you can read more about this on his excellent ‘300 Songs’ blog here) it is a typically esoteric nine song collection recorded with a variety of accomplices over several years. Opening with the titular ‘The Palace Guards’ the album throws an immediate curve-ball, the song doesn’t sound like either of his bands, it sounds more like Pavement. Two thirds of the way through the song it takes a twist and sounds just like a David Lowery song, and a good one at that. The songs on the album sound in parts like you’d expect it to, a bit Cracker here, a bit Camper Van Beethoven there and even some snatches of Sparklehorse (the late Mark Linkous guests on the album). This is no surprise, I certainly wasn’t expecting a brand new direction for this record, and a it is an album that has an identity of its own. The songs are top quality throughout, we get stomping country on ‘Raise ‘Em Up On Honey’, indie rock on ‘Baby, All Those Girls Meant Nothing To Me’ and (best of all) whimsical balladry on ‘I Sold The Arabs The Moon’. There really isn’t a bad track on the album, and in the few weeks I have owned the album, it has already become my most played record of the year. You can tell that the songs here were not conceived as an album. They don’t flow in a sequence as a purpose created album would, some changes of pace and style are a little jarring. This doesn’t seem to matter though as the quality of the songs is so good, it is a little like listening to a “best of” collection from a set of albums you’ve never heard. The one downside of the album is the length, at only 9 tracks it is over all too soon. But hey,that means that you get an album, as Sum 41 would say, that is all killer, no filler. To buy a signed copy of the album (and get an immediate digital download) go to David Lowery’s website here. Neutral Milk Hotel’s Jeff Mangum is to curate an ATP Festival in the UK this December. The event takes place at Butlins, Minehead, from 2 to 4 December. This will be the first of two ATP festivals taking place in December at the venue, with the second to be announced later. Tickets go on sale this Friday (18 Feb) from See tickets. The truth for me is that Anagrams are a musically competent band. They’ve got a good style, can clearly play but musically they are just so uninspiring. We Form a Shelter is a little bit Smashing Pumpkins, a hell of a lot of Radiohead. There’s nothing new here and listening to it made me feel a little flat and even sad. I’ve canvassed some opinion via Facebook and found I’m not alone in being somewhat nonplussed by We Form a Shelter. I’ve been advised to do a “praise sandwich” in the review. Start off with a compliment, drop the bombshell that I don’t like the album and follow it with another compliment. I think this sums it up perfectly. This is a band that can go anywhere but are being held back by playing it safe. They claim on their press release, which name checks Pavement and Mogwai as well as Radiohead as inspiration, that the album takes a “heartfelt look at the human condition, from paranoia and mental illness to frustration and insecurity.” But I’m not convinced that such weighty issues can ever be effectively conveyed through this kind of bland indie rock. The album opens promising enough with ‘Autumn Leaves’, some beautiful guitar playing, building up nicely but then the first lyrics come in, “can we slow things down, for a minute.” Momentum is promptly lost and the song just meanders along slowly for another three minutes, not the one I was promised at the start. The same pattern emerges time and time again across the tracks. The six minute melody-less ‘1711’ is six minutes I’ll never get back and ‘Fits and starts’ which the band clearly rate enough to give a video, has elements of The Sundays guitar playing, more Radiohead, but overall its too clean, crisp and bland to be anything like those two bands at their peak. I’m not sure what part of Pavement inspired them, perhaps their lead singer Stephen Malkmus’s lengthy guitar meanderings with his later band the Jicks. But even at his most fret wankerish at least Malkmus has balls. My advice, if they care for it, which by now they probably won’t, is to have a really good think about the music they like, the music that inspires them and ask themselves not how can we sound like them, but how can we be as inspiring, as unique as them? What is it about their musical heroes that brings smiles to their faces or tears to their cheeks. Our advice to Anagrams is to go back to the rehearsal room, get drunk, take drugs or whatever it is that gets the creative juices flowing, listen to music properly and really enjoy making it again, perhaps like they did when they started out. Their press release goes on to say they have supported the likes of The Antlers, Wooden Shjips, The Joy Formidable and The Phantom Band. Unless they take a “heartfelt look” at their own musical condition then sadly this will probably be as far as they get. With a bit more originality the above list of bands could be supporting them some day. We’re enjoying the latest star studded video by The New Pornographers from last year’s album Together. It features the story of the New Pornographers in movie form, with just a pinch of creative licence. Watch out for Ted Leo having fun portraying the band’s multi-instrumentalist Kathryn Calder. Others involved include Paul Rudd. The Primitives are back with their first new recording since 1992. We’ve been sent an early copy ahead of its 7 March release and have been left pleasantly surprised. The tracks have got that familiar bubble-gum, indie-pop feel as their 1980s and early 1990s singles like ‘Crash’, with the infectious ‘Rattle My Cage’ a real highlight. The title track has less impact, but with more than a few nods to the 60s and the same keen sense of melody as their early hits it shows a band that is clearly pleased to be back and happy to stick to what they are best at, rather than go in some new misguided direction. It’s a good thing they haven’t changed much over the years as with a string of UK dates coming up during March and April they are facing the tough ask of pleasing the old guard of aged indie kids again, as well as those young enough to be their sons and daughters. For us aged indie kids at Neon Filler the new tracks should slot seemlessly into their set. 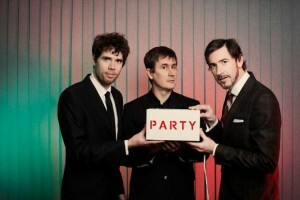 Being signed to Fortuna Pop is a good fit for the band as they seek to appeal to young and old alike, especially as the indie label is home to other elderstatesfolk of indie music such as Darren Hayman, as well as new indie kids on the block like Allo Darlin’, Fanfarlo and Pains of Being Pure At Heart. The Mountain Goats have announced a string of UK dates to support the release of new album All Eternals Deck this spring. The tour takes in Dublin, Brighton, London, Manchester, Leeds, Glasgow and Newcastle during May, just weeks after All Eternals Deck is released on 4 April on Tomlab in the UK. This is the first release by the band since they signed to Merge Records in the US last year. Here’s a full list of dates and venues. Smith Westerns from Chicago used to be called lo-fi and on their self titled 2009 debut album they fitted this tag perfectly, with its poorly produced blend of nothing special mixed with fuzz. But following a move to the Fat Possum label and with producer Chris Coady, who has worked with TV on the Radio and the Yeah, Yeah, Yeahs, at the helm the band has been transformed. The band’s love of British indie from the ’90s has been allowed to flourish under Coady and on this, their second album, they’ve been spruced up a treat. There are elements of Suede, even Oasis in places, but the overall feel is as near as we’ve heard to Bandwagonesque era Teenage Fanclub and in turn the 1970s sounds of T Rex and Big Star that influenced it. All guitar squeals and melody with clear crisp production. Sure we’ve heard it before with Teenage Fanclub, but this trio are here and now, have youth on their side and an energy that shines through. Opener ‘Weekend’, the album’s first single is a great start. It’s harmless but with edge, hard yet sweet. Tough tricks are being pulled off on Dye It Blonde by Coady and this trio of skinny jean wearing, lanky indie-rockers. Among other highlights are ‘All Die Young’, which starts with church organ before the sweeping, soaring 90s indie guitar kicks in. They love a good melody as well, such as on ‘Still New’. If there is a criticism to be made its that lead singer Cullen Omori’s voice is not as strong or distinctive as the likes of Brett Anderson from Suede or even the late great Marc Bolan. But its the most minor of gripes. Omori and his band look the part and can expertly recreate the music that we love here at Neon Filler. That’ll do us quite nicely for now. Dye It Blonde was released in the US in January. There’s been no UK release date set, but this album is fairly easy to pick up as an import via the likes of Amazon for around the £8 mark. Cloud Nothings were one of the bands we picked to watch in 2011, and on the basis on this debut album the jury is out over whether that is the case or they are as unsubstantial as their moniker suggests. Cloud Nothings is the product of one man, Dylan Baldi, who plays all the instruments on the album. The good news is that the songs sound just as fresh as the early singles, the use of a producer has smoothed the edges a little but this is no big production number. Each song fizzes into life and hits the ground running, all Buzzcock’s guitars, fuzz and plaintive vocals. Opener, ‘Understand At All’, is great and sets out the feel for the rest of album. Second track ‘Not Important’ is more of the same, albeit with more aggression in the vocals which recall Milo Aukerman of the Descendants. The album does have some shortcomings, the biggest of which is a matter of depth and variety. There isn’t a bad song on the album, but heard in sequence they are a little too similar and quickly merge into one. On ‘Forget You All The Time’ things slow down a little but in the most part we are looking at full pace three minute fuzz pop songs. The other problem is the quality of the songwriting. The melodies are great and it is played with real verve, but too many songs are based around a mumbled couple of verses followed by the song title being repeated over and over for the second half of the song. These criticisms aside it is an enjoyable album and a pretty promising debut. At less than 30 minutes long it never outstays its welcome and is a fun and fresh record. Baldi is still definitely one to watch, but he’ll need to up his game on his next album.